Printer Stand? End Table? A spot for cookbooks in the kitchen? A file organizer? 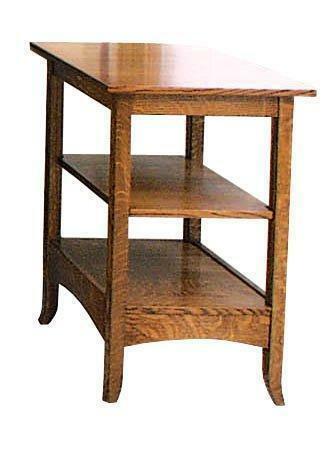 Our Amish Shaker Hill Printer Stand or End Table can be used for a variety of purposes. This Shaker style is built from solid wood with a rectangular top with reverse bevels and two open shelves. The shelf closest to the base includes an apron detail with slight pointed arch. Gently tapered feet complete the look. While the bottom shelf is fixed, the center shelf can be adjusted to suit your needs. Shown in quarter sawn white oak with Michaels Cherry stain.